Films are all very well, but, as far as I am concerned, the event at Kendal is the Boardman Tasker Award. Having enjoyed the welcome boost of having my first book win the prize thirty years ago, I know just how valuable the BT brand is. (I also hold the record, apart from the late dear Jim Curran, for the greatest number of non-winning shortlisted titles!). So it has been a huge pleasure, the last couple of years, to interview the latest crop of shortlisted authors, especially Simon McCartney, whom I last met in 1979 on the classic Avon Gorge E2, Drang. (He was airborne at the time, having just fallen from the crux). 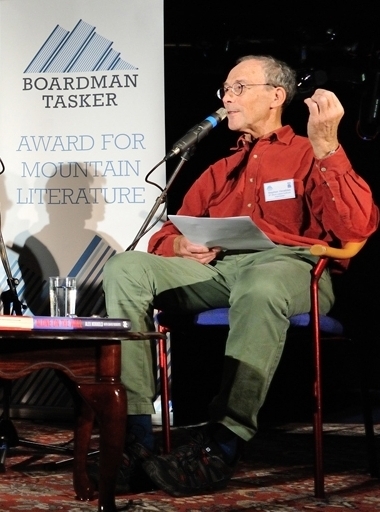 I had a sneaky hunch that he might win the prize with his remarkable tale of survival on Denali, but all the other shortlisted authors had compelling tales to tell. Apart from the quality of the writing, what made the books so rewarding for me was learning more about events and people I was partially familiar with: the great innovator George Finch, the St Helen’s eruption, the extraordinarily varied career of Mark Vallance and Alex Honnold’s game-changing solo of Half Dome Northwest Face. Like Andy Perkins, who introduced the event, I was hugely inspired in the late seventies by Pete’s and Joe’s articles and books – in particular their accounts of that beautiful climb up the West Wall of Changabang. Like thousands of other people who never actually met them, I feel that I know them through their writings, and it is wonderful to see their legacy living on through the most coveted award in the mountain world. Newer PostCalling all publishers of mountain books!